NYPD stop-and-frisk: A ringing defeat for stop-and-frisk and a huge win for civil liberties. 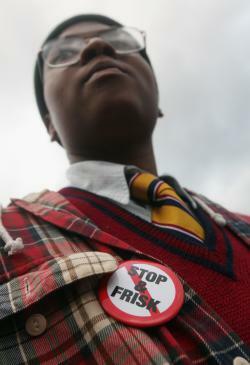 An opponent of the New York Police Department’s controversial ‘stop-and-frisk’ policy marches on January 27, 2012 in the Bronx. In March of 2012, several New York City residents sued the New York Police Department over alleged overreaches of its controversial stop-and-frisk policy. * The plaintiffs argued that the NYPD “has a widespread practice of making unlawful stops on suspicion of trespass” outside certain buildings in the Bronx, and asked the court for relief from the department’s Trespass Affidavit Program (TAP). On Tuesday, they got their wish. Finding that NYPD officials showed “deliberate indifference” to the unconstitutionality of the relevant incidents, U.S. District Court Judge Shira Scheindlin issued an injunction prohibiting unjustifiable stop-and-frisk actions outside of certain Bronx buildings. This is obviously a blow to the NYPD’s stop-and-frisk policy, and it possibly carries long-term implications for similar policies elsewhere. The TAP case is the first of three stop-and-frisk cases pending in Scheindlin’s court, and this injunction might indicate how she will eventually rule in the other two. Predictive value aside, the injunction is a powerful rebuke to systematic law enforcement excesses, and should be read and studied by anyone with even a passing interest in civil liberties. For years, while patrolling outside certain apartment buildings in the Bronx, NYPD officers systematically stopped and questioned people on suspicion of trespassing—without any evidence that the people were actually trespassing. They did this under the aegis of the Trespass Affidavit Program, formerly known as Operation Clean Halls. TAP is designed to help police high-crime areas by empowering officers to patrol in and around privately owned buildings. It began in the 1990s, after many drug deals moved indoors as a result of police crackdowns on street-corner sales. TAP theoretically gives the police the flexibility they need to go after drug dealers, gang members, and others who are trespassing with crime on their minds. In practice, though, the patrolling officers hardly differentiated between criminals and citizens. They consistently stopped people outside Clean Halls buildings, with little evidence that those people were actually trespassing. The lead plaintiff in the case, Jaenean Ligon, took action after her 17-year-old son was stopped for no reason outside his apartment building following a trip to the store to purchase ketchup. Most of the other plaintiffs in the case were stopped on similarly dubious grounds. A person approaches or exits a Clean Halls building in the Bronx; the police suddenly materialize, stop the person, demand identification, and question the person about where he or she is coming from and what he or she is doing; attempts at explanation are met with hostility; especially if the person is a young black man, he is frisked, which often involves an invasive search of his pockets; in some cases the officers then detain the person in a police van in order to carry out an extended interrogation about the person’s knowledge of drugs and weapons; and in some cases the stop escalates into an arrest for trespass, with all of the indignities, inconveniences, and serious risks that follow from an arrest even when the charges are quickly dropped. The comprehensive 157-page injunction makes much of the fact that the relevant TAP stops routinely violated the Fourth Amendment. The Supreme Court has ruled that police officers cannot stop and detain a citizen for investigatory purposes without specific, articulable suspicion that he or she is engaged in criminal activity. This is called a “Terry stop,” after the plaintiff in 1968’s Terry v. Ohio. If an officer initiates a Terry stop without reasonable grounds for doing so, then the officer is violating the Fourth Amendment safeguard against illegal searches and seizures. But it’s very hard to define exactly what constitutes a Terry stop, as I’ve explained in my prior coverage about supposedly “consensual” police encounters. While police officers can’t just stop you and accuse you of a crime without grounds for doing so, they are allowed to stop you for a friendly chat. This is called a consensual encounter, so named because the interaction is theoretically voluntary. (Here are my tips on how to avoid these encounters with the police.) Essentially—I’m simplifying here—the NYPD claims that the relevant TAP incidents weren’t Terry stops, but consensual encounters. Thus, its officers didn’t need reasonable suspicion to detain and talk with these alleged trespassers, because the detainees could’ve terminated the encounters at any time. Perhaps in an idealized scene from another era of policing, a local officer might have politely posed these questions to a stranger near a building with a trespass problem, and the stranger might have gladly consented to answer the questions, knowing full well that he was free to walk away, but answering the questions out of politeness or a sense of civic duty. Here, by contrast, no reasonable person in plaintiffs’ position would have felt free to leave during their encounters with the police. The editorial misses the point, perhaps deliberately. Scheindlin’s injunction makes clear that this particular facet of the NYPD’s trespass policy wasn’t just unconstitutional, it was ineffective. Bronx ADA Jeannette Rucker often declined to prosecute arrests for trespass made outside Clean Halls buildings, and judges repeatedly dismissed trespass cases because the arrests were made without probable cause. According to internal police documentation, out of 1,663 stops made outside a TAP building in 2011, 1,044 of them “lacked any justification … that would have constituted reasonable suspicion of trespass.” And Scheindlin finds that, roughly, a mere “13 percent of trespass stops in the Bronx in 2011 resulted in arrest.” Or, in other words, 87 percent of the people stopped under the TAP protocols were released because they very likely were doing nothing wrong. Despite the Post’s assertions, these stops aren’t keeping guns off the streets. All they’re doing is wasting police and judicial resources. The people who brought this suit weren’t Park Avenue types, but law-abiding Bronx residents who had been adversely affected by this policy—illegally stopped and detained in their own neighborhoods by officers who harbored a reasonable suspicion that the detainees were poor and black. *Correction, January 9, 2013: This post originally and incorrectly stated that the Trespass Affidavit Program lawsuit was filed “earlier this year.” In fact, it was filed in early 2012. The relevant sentence has been corrected.